It’s a great time to be a gamer! Whether you’re a fan of classic arcades, new consoles, or pinball machines, it seems there’s always something to be excited about. 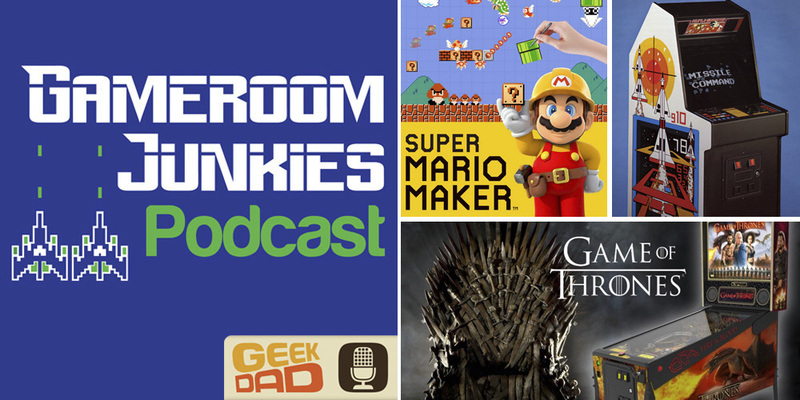 In this episode of the podcast, we talk about new additions and updates to our personal gamerooms. In the “Console Corner” segment, Bryan dishes about his love for Mario Maker and helps Preston try to understand the allure of the Amiibo. The big announcement this month has been the revelation that Stern Pinball is releasing an all new Game of Thrones pinball machine. Tune in to hear about some of the features and our thoughts on the game photos before we dive into the mailbag. Listeners ask the Junkies for our thoughts on the rise of arcades as bars, our favorite ’90s games, and advice on a game pickup. We’re all over the place on this episode, but it is a fun ride nonetheless. Remember, you can help support the show and save 10% on your next PinballBulbs.com LED purchase by using the code “gameroomjunkies” at checkout. Also, I’d like to throw in a quick plug for Wizard Mode, a documentary short film looking to garner funding for a full-length feature through an IndieGoGo campaign. As I mentioned before, the short was really good, so consider donating to make it even better. Thanks for listening and supporting the show! On episode #55 you mentioned some art you found on eBay that was based on Atari games. Can you provide a little more detail? This sounds right up my alley but I can’t find the seller.